Trade visitors are welcome within our normal opening hours (Monday to Friday 9.30 - 4.30). 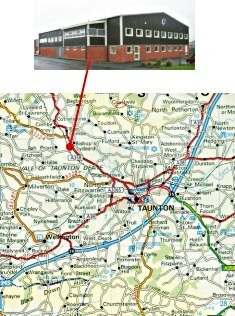 We are right next to the West Somerset Railway terminus at Bishops Lydeard on the road from Taunton to Minehead. For those without an AA road atlas, leave the M5 at junction 25 following the dual carriageway straight over one roundabout, straight on over traffic lights, over the next roundabout and past the cricket ground on your left. At the T junction and traffic lights turn right and look for signs to Minehead (A358). Follow the road round, go across one roundabout and take the second exit at the next by the Cross Keys pub. Follow the A358 towards Minehead for about 4 miles and cross another roundabout. You will see the trading estate on your left and signs to the railway. (If you're lucky there may be signs of steam). Leave the M5 at junction 26 and follow signs to Taunton, right at roundabout along the A38. After four miles turn left at the roundabout, signed to Minehead, and over the new expensive rail bridge past the Park and Ride. At the next roundabout turn left and take the second exit at the next by the Cross Keys. Follow instructions listed above.